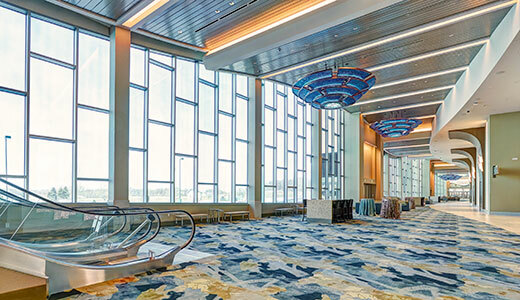 SageGlass®, manufacturer of the world’s smartest electrochromic glass, announced the completed installation of 11,000 square feet of dynamic glass on the western façade of Mystic Lake Center, an addition to Mystic Lake Casino Hotel. SageGlass dynamically controls sunlight to provide visitors with access to natural light and unobstructed views of the surrounding golf course. Owned and operated by the Shakopee Mdewakanton Sioux Community, Mystic Lake chose to install SageGlass on the entire western façade of the building to optimize daylight, outdoor views and comfort while preventing glare, fading and overheating. By maintaining access to daylight, visitors can experience the benefits of the outdoors, including stress reduction, enhanced creativity and an improved sense of wellbeing. The 70,000-square-foot meeting and event space includes a nine-story, 180-room hotel tower; three large ballrooms with flexible layouts; several smaller meeting rooms and an executive conference room; and a separate entrance to the casino with a designated parking area for meeting guests. With the addition of Mystic Lake Center, Mystic Lake Casino Hotel is the second-largest hotel in the Minneapolis-Saint Paul area, with 766 rooms. Showcasing a modern, natural design, Mystic Lake Center is the newest addition to Mystic Lake Casino Hotel. The 70,000-square-foot meeting and event space accommodates groups of all sizes for a range of meetings and events – from business meetings to holiday parties to conferences and expos to weddings. Mystic Lake Center features a nine-story, 180-room hotel tower; three large ballrooms with flexible layouts; several smaller meeting rooms and an executive conference room; and plenty of natural light and stunning golf course views. For more information, visit mysticlakecenter.com.